1. I've been wanting to do this for a while. 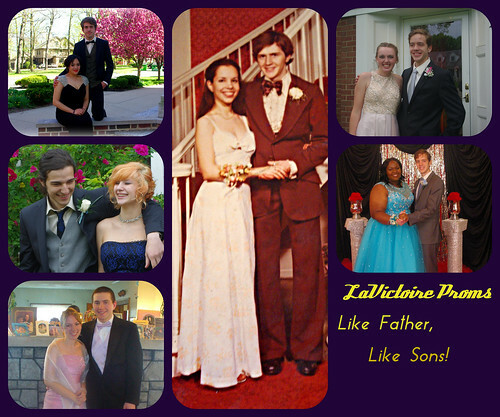 Here are the prom pictures for all of my sons. I actually shot all of the pictures except the one with me and Mr. Pete. I think it's so funny that the youngest son, the one who may go on to seminary studies, actually went to two proms with two different ladies! "In all honesty, I don't think you've done particularly well in homeschooling... "
Congratulations! Noah LaVictoire has been arguably my best ever AP World History student! His grasp of the Chinese Zhou Dynasty and perennially difficult pre-Columbian Mayan Civilization is astounding! I shall miss him terribly! There are ups and downs during homeschooling. I'm glad Noah's adventure is ending on an up note! 3. Since I had a birthday this week, I was reading a lot of articles on being over 50. I got a kick out of this article which opined: "Turning 50 has never been so popular.... or looked so good!" Um... does that mean that DEATH was more popular than turning 50? Seriously what are the options here? 4. An anonymous person sent me these savings bonds over the weekend. They are in my mother's maiden name and they were sent to her by my grandmother. Mr. Pete quickly took them over to the bank. 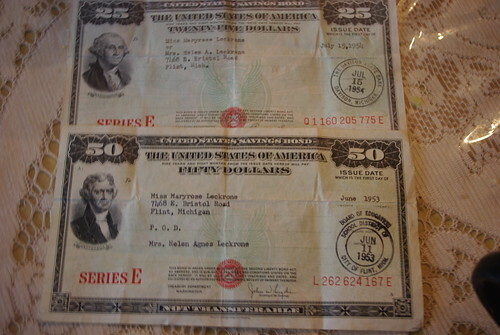 It appears that in over 50 years, these bonds have only accumulated a wealth of a little over $500. And, to make it more convenient, you can't redeem them at the bank any more. Although my sons were thrilled to see the increase, I showed them that if grandma had bought 2 ounces of gold for around $68, the wealth would have grown to well over $1000, or double what the bonds are actually worth. The lesson - US Savings Bonds aren't the investment they were cracked up to be - even when they were being heavily touted as a great investment. They were a SAFE investment though, which I guess is a different thing. And considering the trouble of redeeming them, it's likely the government might get to keep my grandma's $75 for a while longer. 5. Today is the Feast of the Sacred Heart of Jesus. 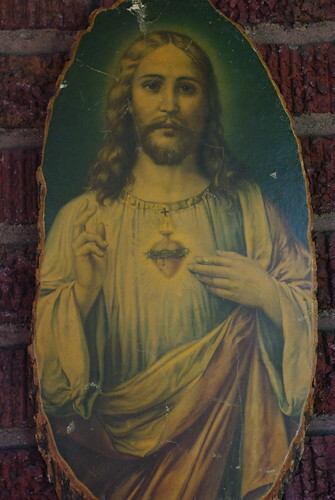 This image of the Sacred Heart has been in my family since I was a little girl. It looks like someone might have picked it up as a souvenir at a shrine some place in Michigan. I love it's outdoorsy look, and it hangs outside my front door, protected by the screened in porch, all year round. 6. 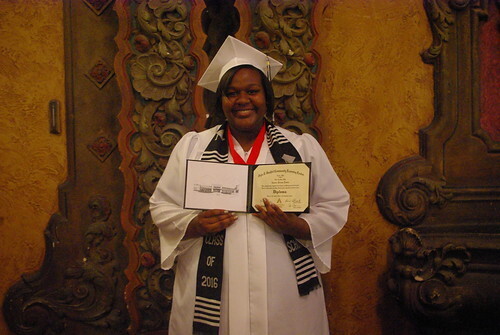 Wednesday was also my goddaughter's graduation from high school! 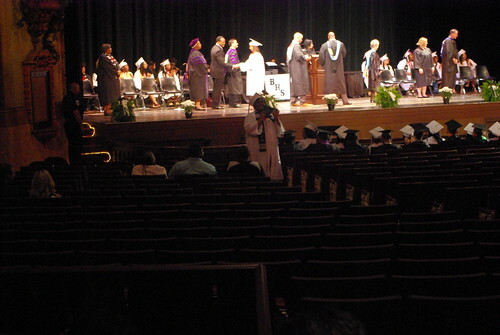 The ceremony took place in the historic Civic Theater in downtown Akron. Leon Harris, a Buchtel graduate and a CNN anchorman, gave the commencement speech, and I have to say - it was the best graduation speech I have ever heard. I don't know if the graduates are really seasoned enough to get a lot of what he said, but I think many of the older adults in the audience came away feeling inspired and blessed. Those of us that were able to pay attention that is - because for some reason, the PTB decided that the entire audience should be crammed into the back half of the theater. No one was allowed to sit in the front half of the cross aisle. Subsequently, many were feeling cramped, warm and a bit uncomfortable. When I left my seat to go to the side aisle and get this picture, I was relieved by the coolness in the vestibule and almost didn't go back when I was done! In fact, lots of people felt that way and as graduation continued, I noted that entire rows of people would disappear after their graduate walked the stage. And that was probably the strangest part of any graduation I have ever been to! Note the empty seats - by design! 7. 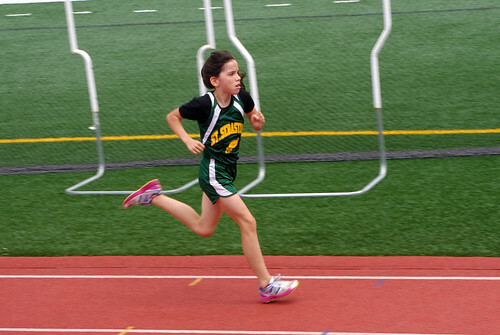 Today my baby girl turns 11. She is the one and only pregnancy and birth I have documented "as it happened" on this blog. I was 46 when she was born. 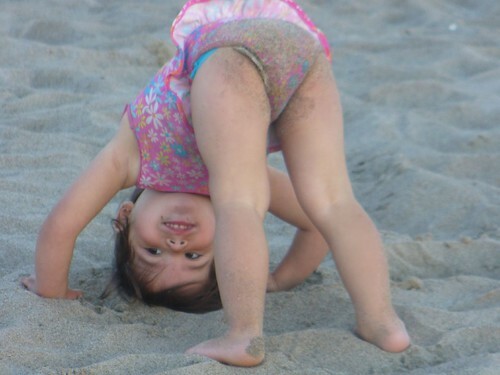 She was also the baby born to me after a stillbirth four years earlier. The conventional wisdom was that at my age, it was risky to try for another baby and that heartache would probably be the result. But she was born healthy and whole, and she continues to bless my life with love and laughter. Last year my oldest son got married and moved away, my other two older sons are living on their own and my youngest son prepares for college. If I had not had my two daughters at age 40 and 46, I would be done with my mothering - but I think God saved the blessing of having my girl children last for a reason. My life would be so empty without both of them. And Rosie's sparkle is a jewel in my life. My boys cashed in their savings bonds; I was disappointed in the return. You're definitely right about the value!